I am not sure if I am right about the Species. He is very sweet and friendly and likes to be up by your face and neck. He is different shades of green with some yellow on the wings. 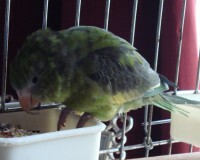 He seems bigger then a parrotlet should be, his beak is overgrown.